For the Broncos’ defense, it was their two stars that shined the brightest on the afternoon. Von Miller was matched up against rookie third-round pick Chukwuma Okorafor, and it played out as much of a mismatch as it appeared. Miller was able to beat Okorafor consistently in pass protection and forced the Steelers to send help over there several times. 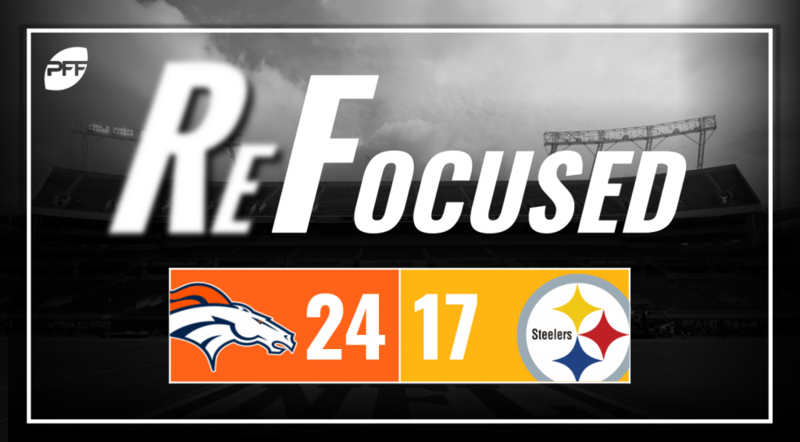 On the back end, Chris Harris Jr. had a phenomenal game covering the talented Steeler wide receivers. Harris played nearly every defensive snap and was targeted many times, but Harris made sure tackles without allowing yards after the catch, making those receptions allowed as actual positve impacts for the defense. Phillip Lindsay has been excellent running the ball this season, and Sunday was no different. He entered the week with the second-highest yards per rush in the league, and with a 14-carry, 110-yard performance, he had his highest average of the season at 7.9 yards per carry. At first glance, it will look like a pretty average performance for Case Keenum based on his stat line, but a closer look will actually show one of his better games of the year. He had two beautifully thrown deep balls that Emmanuel Sanders just quite couldn’t haul that could have changed the game dramatically. He had three or four passes dropped by his receivers, as well. While Ben Rothlisberger moved the ball with consitency (over 450 yards passing), he was unable to take care of the ball enough. Rothlisberger threw two interceptions with the last one in a critical third and goal with under 30 seconds remaining. Those interceptions were his only major blemishes on the afternoon, and overall he had a fine game, but in the NFL turnovers are the most impactful statistic for wins and losses. One of the more shocking developments of the game was Antonio Brown struggling to make much of a decisive impact on the game. Although he caught nine passes, his longest catch only went for 14 yards. Brown was limited to mostly underneath catches and was unable to make defenders miss to extend those plays. The Pittsburgh defensive line did an excellent job of creating pressure. Cameron Heyward and Javon Hargrave repeatedly collapsed the pocket on Keenum, giving the interior Broncos offensive line more than they could handle. Unfortunately, the rushers coming off the edge couldn’t match or take advantage of the interior pressure, as T.J. Watt and Bud Dupree seemed to disappear for most of the game. It wasn’t the Steelers’ best night in coverage with a few lapses. Some were breakdowns on scramble drills, while a couple others seemed like miscommunications or defenders just getting out of their zone. Denver helped them out by dropping a few balls, fortunately, but it’s something they’ll need to shore up going forward. The Broncos’ offense started off slow and still had a few drives in the second half where they couldn’t move the ball, but they strung a couple long drives together to finish drives with touchdowns, coupled with forcing turnovers on defense.